Literature circles with first graders are unique. Students at this age are simultaneously learning to read and write and learning how to interact with others over books. In my classroom, literature circles play an integral role in my overall literacy program -- they support my instruction in the technical aspects of reading. But most importantly, through literature circles students quickly catch on to the greater purpose of learning to read -- to share in a world of wonderful characters who can teach us about ourselves and the world around us. We cultivate an atmosphere of caring and respect from the first day of school. This is one of the most important elements of successful learning -- and successful literature circles. 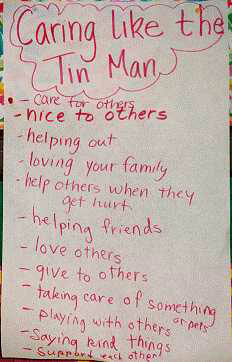 One of our first tasks as a class is to generate a large chart listing qualities of caring that we will live by in Room 1B. This chart hangs prominently in the front of the room and we refer to it daily. I also read aloud every day and we have many, many shared reading experiences with the large numbers of picture books I keep on the bookshelves and tubs around my classroom. When I introduce the concept of literature circles, I ask students to tell me what we do when we listen to each other. Because these are skills we practice all year long, the children can quickly identify what it means to carry on a conversation. We generate a list of qualities of good discussion. Each year, my six- and seven-year-olds come up with the same characteristics I find in children's literature texts -- they know what makes a book worthy of respect. Learning how to work independently during Reading Workshop. We spend several weeks on this early in the year. Even then, it takes several months before students really catch on! I value their independence and have high expectations for how they can work without me. I also praise them for the growth I see every week. During Reading Workshop, children work either individually or in groups from a menu of literacy-related learning activities. The choices for the Workshop may include writing in journals in response to the story once the group has discussed, practicing phonics strategies I have taught during the week, reading stories at the Listening Center, working on spelling, or writing stories at the computer. The specific choices will vary with the literacy skills and strategies I know students need to practice. The most important aspect is that during Reading Workshop, students have choices and opportunities to develop independence, as well as grow as readers and writers. Beginning literature circles. I begin literature circles when I feel students have settled into the routine of Reading Workshop and are ready to add one more component to choose from. As we learn together the processes of literature circles, students read, discuss, write about, and respond to stories in our basal anthology. Although I have found that the stories do not generate the same level of discussion as do trade books with more intricate plots, realistic characters, and memorable language, the anthology is a great place to begin for the simple reason that I have one for each child. Taking part in literature circles is demanding for first graders. While we take the time to learn the processes, I find that the anthology stories work just fine. Friday morning Book Talk to introduce the 5-6 books for literature circles. Children rate the stories from 1-6, with a 1 indicating that the child would like to read it the most. I let my students know that not everyone will get their first choice, but they will read their first choice sometime during the process. Friday afternoon Send home the books and 1 -3 Post-it Notes in large plastic bags. I always include a letter to parents explaining what to do. It explains the objectives of literature circles -- to read, discuss, write about, and respond to a book in a way meaningful to the child -- and makes some suggestions about open-ended questions family members could ask as prompts for the child's thinking. I ask students to mark pages they really liked with the Post-its or paper, and to talk with their families about the story. MondayThe books are returned to school. During Reading and Writing Workshop (~ 10:00 - 11:00 a.m.), I conduct focus lessons on reading strategies such as identifying unknown words, making predictions, using capitalization in writing, or responding personally to a story. These guided reading and writing lessons provide instruction in "how" to read and write. In addition, we will spend time re-reading the literature circle books. This is important for those children who were not able to read at home. Some of my students are already fairly adept readers; they re-read their books either on their own or with a partner. For others, this is the time when I will tailor my guided reading instruction to those skills and strategies needed to read the literature circle book. I will meet with two literature circle groups during Reading and Writing Workshop on Monday. We sit in a cozy corner of my room surrounded by bookcases and snuggled onto a shaggy rug. This helps us concentrate on the discussion but leaves me free to observe what is going on with the rest of the students. I begin each discussion the same way from the very first literature circle on through the year: What is our purpose for literature circles? Why do we come together to talk about books? In answering these questions, students let me know how they are constructing their understanding of literature circles. The responses grow through the year from, "To talk about books." to "We learn what the character feels" and "We learn from each other." Tuesday 1. Introduce the Extension Project (click here to learn more about Extention Projects). At the beginning of the year, when students are reading in the anthology, these projects all relate to creative and artistic ways to build comprehension. 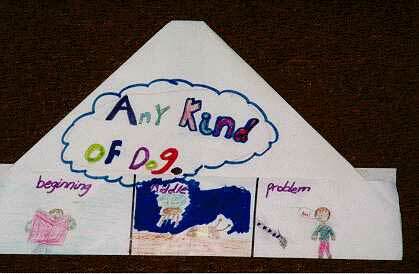 For example, when we were learning the structure of narrative (e.g., beginning, middle, end, problem, solution), the response project was a story hat (see example below) which illustrated these elements from the literature circle stories. When we learned about character traits, we made mobiles showing important scenes about the main character in the books. Later in the year I add more personal response projects which are more open ended: Story quilt, mural, Readers Theatre, accordion book. 2. Discussion and Journal writing. Because literature circles are one piece of the Reading Workshop, students participate in discussion and journal writing at varying times. Some of them will come to the discussion first and then write in their journals; others will bring their journals to the discussion. I find this works really well for first graders -- some children need to talk about what they've read before they're ready to write, and just the opposite for others. When we first start literature circles, I organize the groups with this in mind. Wednesday During Reading and Writing Workshop, I meet with two literature circle groups. 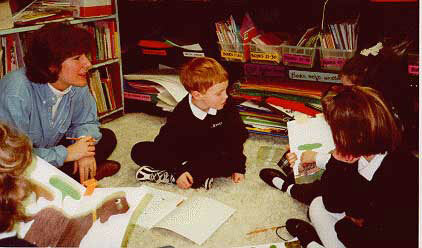 Children can choose to work on their extension project during Reading and Writing Workshop. Thursday During Reading and Writing Workshop, I meet with the last literature circle group. Children can work on their extension project during this time. The books are sent home again in plastic bags with Post-it Notes. Again, I will tell the children something I want them to look for or to be ready to discuss during literature circles the following week. They should mark these areas with their Post-it Notes. I use the rating list from the earlier week to determine which child receives what book (this is how I make sure that all children get to read their first-choice book at some time during the literature circle cycle). Friday Finish up Reading and Writing Workshop, including their extension projects. Children share their extension projects with the class.